Tell me where you lost the company of a Christ, and I will tell you the most likely place to find him. Have you lost Christ in the closet by restraining prayer? 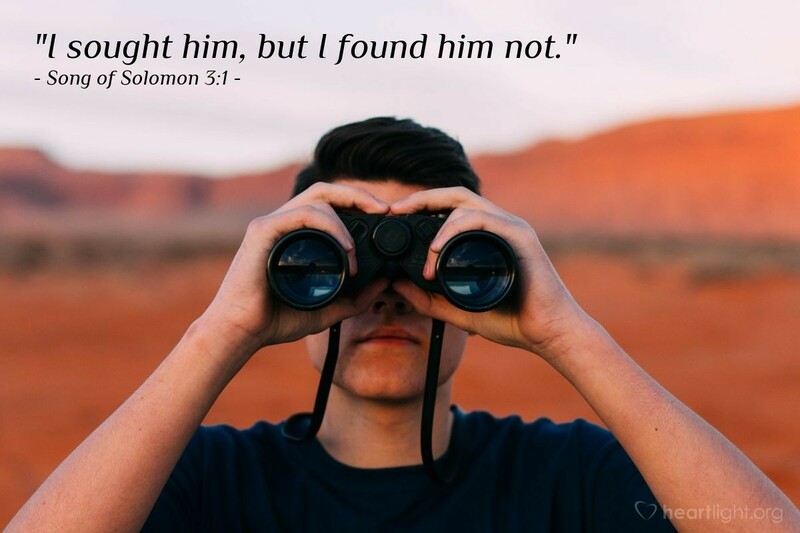 Then it is there you must seek and find him. Did you lose Christ by sin? You will find Christ in no other way but by the giving up of the sin, and seeking by the Holy Spirit to mortify the member in which the lust doth dwell. Did you lose Christ by neglecting the Scriptures? You must find Christ in the Scriptures. It is a true proverb, "Look for a thing where you dropped it, it is there." So look for Christ where you lost him, for he has not gone away. But it is hard work to go back for Christ. Bunyan tells us, the pilgrim found the piece of the road back to the Arbour of Ease, where he lost his roll, the hardest he had ever travelled. Twenty miles onward is easier than to go one mile back for the lost evidence. Take care, then, when you find your Master, to cling close to him. But how is it you have lost him? One would have thought you would never have parted with such a precious friend, whose presence is so sweet, whose words are so comforting, and whose company is so dear to you! How is it that you did not watch him every moment for fear of losing sight of him? Yet, since you have let him go, what a mercy that you are seeking him, even though you mournfully groan, "O that I knew where I might find him!" Go on seeking, for it is dangerous to be without thy Lord. Without Christ you are like a sheep without its shepherd; like a tree without water at its roots; like a sere leaf in the tempest-not bound to the tree of life. With thine whole heart seek him, and he will be found of thee: only give thyself thoroughly up to the search, and verily, thou shalt yet discover him to thy joy and gladness.